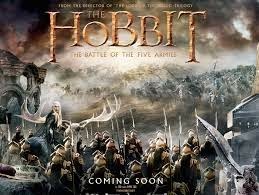 The Hobbit: The Battle of the Five Armies Storyline:To say that the past portion of Peter Jackson's three-section adjustment of J.r.r. Tolkien's "The Hobbit" left things open-finished would be putting it mildly, since actually all the characters were left in a position of danger. Luckily, the principle cliffhanger of the monster Smaug leaving his cavern in the wake of being stayed there for quite a long time with the aim of assaulting Lake Town is determined in the initial 15 minutes of the motion picture, leaving a void for others to assume control over the previous diminutive person's mountain home. In that lies the principle clash at the core of the last demonstration, on the grounds that the diminutive person lord Thorin Oakenshield (Richard Armitage) made guarantees to the people of Lake Town to provide for them their offer of the gold inside the mountain and after Smaug demolishes their home, they can utilize the cash. The mythical beings have their own fortunes lost to Smaug that they need back while Sauron needs the Lonely Mountain for its key area in his arrangements to overwhelm Middle-earth. Luke Evans' Bard is likely the genuine legend of the third film, attempting to ensure and spare the populace of Lake Town, and he makes a decent partner to Thorin, who has been undermined by the influence and riches he's picked up with Smaug's takeoff. With such a great amount of concentrate on others, that pretty much rules out Martin Freeman's Bilbo Baggins i.e. that hobbit in the title who is gotten trying to attempting to cool everybody off before it prompts war. As one may anticipate from the title, it does lead to a monster fight, yet not at all like "The Return of the King," this isn't simply an hour of war between a large number of CG additional items, additionally various littler one-on-one fights that offer a fulfilling determination to the remaining details made by the past two movies. The sentiment between she-mythical person Tauriel (Evangeline Lilly) and the dashing midget Kili (Aidan Turner) still gives the enthusiastic center to the motion picture with the lovelorn Legolas (Orlando Bloom) giving a percentage of the cash shot activity minutes, yet there aren't about the same number of fun bits in the finale as in "The Desolation of Smaug," despite the fact that we do get an extraordinary grouping with Cate Blanchett, Hugo Weaving and Christopher Lee as their characters from "The Lord of the Rings." It's presumable that Tolkien perfectionists will keep on being irritated by the screen time given to characters that never existed in the first book and the measure of subplots that adds to the mix. Jackson's choice to augment the single story into a set of three eventually does pay off, however. Likewise with "The Return of the King," Jackson doesn't appear to know very where to end the film but to make a constrained tie-into the opening of "The Lord of the Rings," driving home the point that this is all that much intended to be a prequel to what is eventually a far unrivaled set of trilogy.